Installation of laundry GFCI receptacles and GFCI protection for utility / wet bar sink areas where the electrical outlets are installed within 6ft from the outside edge of the sink is required by the 2008 NEC (National Electrical Code). Remember to always upgrade to the latest code requirement, if making any modifications of an older electrical installation (i.e. if replacing and old, regular / not GFCI type electrical outlet in the area where GFCI is currently required, make your life safer – install GFCI receptacle). Laundry equipment outlet should be located within 6ft from the appliances. This is very important, so you are not going to use any extension cords for that purpose. Extension cords might have lower ratings than the appliance requirement – your washer or dryer might need more current than the extension cord can carry, which condition could overheat the cord and create a fire. If you have a sink in a laundry room and its outside edge is within 6ft from any receptacle in this room – that receptacle must be GFCI protected. Receptacles installed in a laundry room without the sink do not require GFCI protection. It doesn’t matter where the bar sink is (basement, bedroom, living room, etc.) 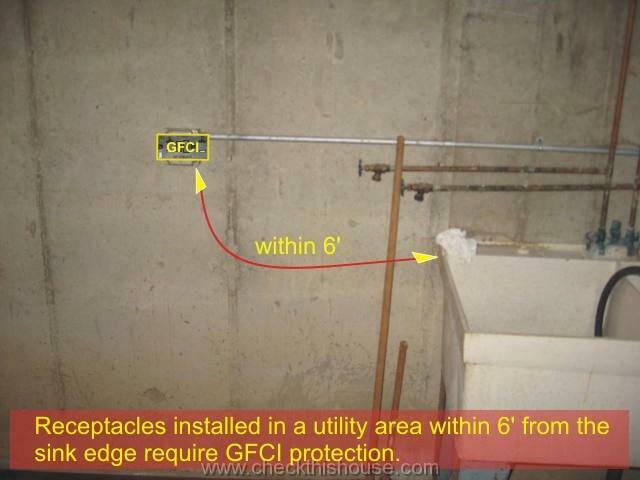 if you have an electrical outlet within 6ft from the wet bar sink outside edge, it must be GFCI protected.